If you’d been subscribed to the NosillaCast News you’d have known what was going on with my site last week. Easy to remember Amazon affiliate link now at podfeet.com/amazon. Teach your Mac to talk with these fun terminal tricks. 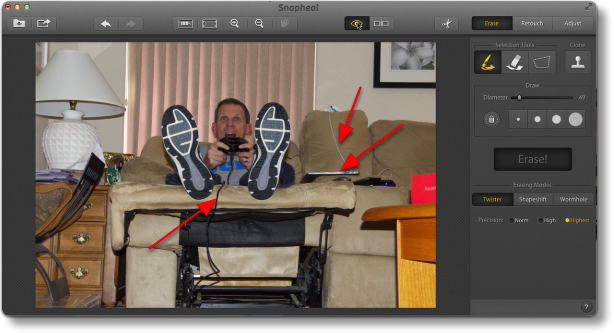 Full review of Mac application Snapheal from snapheal.com to erase icky things in your photos. In Dumb Question Corner I answer Kevin and Mark’s question, “why not Squarespace?” In Chit Chat Across the Pond Bart takes us into Taming the Terminal where we actually get to start poking around in our directories. Hi this is Allison Sheridan of the NosillaCast Mac Podcast, hosted at Podfeet.com, a technology geek podcast with an EVER so slight Macintosh bias. Today is Sunday May 26, 2013 and this is show number 420. We’ve got a lot on the table for the show today – after a short PSA, we’ll hear a quick note from Guy about his chat with us last week, some fun with Terminal and VPN, and then I’ll give you my review of Snapheal from snapheal.com. In Dumb Question Corner, I’ll answer the question, “why not SquareSpace?” and in Chit Chat Across the Pond Bart takes us through Taming the Terminal Part 4 of n where we actually get to start navigating around in our file system. Last week when my site was borked, you may have been wondering what was wrong. I wanted to remind you that if you had subscribed to the NosillaCast News, you would have known what I was doing to try to fix things. If you go to podfeet.com and click on the NosillaCast News tab in the menu bar, you can subscribe by just entering your email address, and then choose if you want the pretty html version of the newsletter, plain text, or a mobile version. Every Sunday night you’ll get an email IF the podcast went out, and that’s it unless something really cool or really bad is going on. For example, when the Macheist bundle came out for $10 including Clarify, I did send out a quick note on that, and when podfeet.com was borked out, I sent out a quick note to make sure every one was kept up to speed. It may not be for you, but there’s no danger giving it a try because every email ha a link to unsubscribe if you don’t like it. A while back Mike McPeek (aka @dscchipman suggested that I really should make all of your lives easier by creating a link from podfeet.com/amazon to my affiliate link. That way you don’t have to hurt your brain or your fingers trying to find the Amazon button on podfeet.com, you will instinctively know how to find it! Well I want to be helpful of course, so now just in time for your Father’s day shopping – try out podfeet.com/amazon to make the dad’s in your life happy and to help out the podcast. This now closes out the Public Service Announcement segment of our show. I’m glad Guy sent that In, I think a often about how we all get to where we are. I think that saying “it takes a village” is really true in podcast land – we all have to help each other. I had such a giant blast using Donald’s instructions to create my VPN server on a spare Mac in our house. This week Dorothy (aka @maclurker in the chatroom and on Twitter) is off on her boat and before she left I whipped out a couple more connection files so that she could use my VPN from her iPhone, iPod Touch and the iMac she has on her boat. It took me about 2 min to find the spot in the tutorial that Donald and I put together and boom, she was in business. It’s the gift that keeps on giving! You know I can’t just leave things be though, I had to try another step – could I actually connect into my network and do something on other machines. Since the Mac I’m using on the outside is now actually on the inside of my network, it means I can do all kinds of interesting things. I can Secure Shell (SSH) into the VPN server and poke around using the command line. That was fun and geeky for sure. Then I realized from there I could actually use the built in screen sharing in the Finder to actually use the Mac GUI. Isn’t that crazy? So now what does this have to do with my VPN server? Well, remember I said I could SSH into my VPN server? Well picture this – I’m at work, Steve’s at home, and I SSH’d into the VPN server and had it say hi to Steve! It was pretty fun. I love this! It pretty much has just about zero value but I think it’s awesome. I don’t remember whether Bart has mentioned it yet, but there are these things called man pages for every command in unix, they’re essentially little (or big) manuals on how to use the commands. I have often looked at the man pages but pretty much never knew what to do with them. After Niraj said to use -v to change the voice, I decided to peek into the man pages for say and sure enough there was more fun to be had. After typing say, if you add -r and a number, it speaks at that rate in words per minute. About 2-300 words per minutes sounded pretty good to me. Still having fun with this? if you type -f and follow it with a file name, it will read the file out loud to you! I had to test out a lot of different file formats; it didn’t like .docx or .doc at all, or even .rtf but it was delighted to read .txt files to me. There’s even a progress indicator you can add to the command – if you type –progress it creates a little counter by percentage of how far through the file it is, what bit rate it’s working at and how much time it’s taking to read it out. I’m not sure I need to be able to do this but it really is fun. There’s a bunch more options you can play with – have fun! I know this sounds weird but one thing that’s been bugging me is that there are cooler photo editing apps on the iPad than there are on the Mac. Oh sure, you’ve got Photoshop, Photoshop Elements, Pixelmator and Acorn, which are super powerful, but some of the finger-based stuff is missing from the desktop. Steve Stanger taught me about Touch Retouch HD from adva-soft.com/products/touch-retouch/ which is an awesome app for the iPad that lets you erase things from a photo that you don’t like by simply scribbling over it with your finger. I REALLY like Snapseed too for iPad which has a really interesting interface for modifying photos. With finger drags you can adjust contrast, saturation, brightness, and do all kinds of cool presets for filters. Google bought the makers of Snapseed, Nik Software and cancelled the desktop version of Snapseed. Thanks for that Google. I was glad to hear about an app that brings some of the functionality I’ve been enjoying on the iPad over to the Mac desktop. It’s called Snapheal from snapheal.com. With Snapheal, you can simply brush over something you don’t like in a photo to create a mask, and have it simply erased. Unlike Snapseed on the iPad, you can control a lot of how things get erased. You can use the controls to change the size of the selection tool (or using [ and ] which I like), and after you select the area you have three different types of erasing modes to actually perform the maths to get rid of your selection. Your choices are Twister, Shapeshift and Wormhole. I don’t know what the three modes are, but I did notice that depending on the environment, your results will vary on which one you like. With each of the three modes, you also get to adjust precision levels of norm, high or highest. This allows an easy workflow to see if it got close on Norm for a given mode, and then you might want to up the precision level to improve things. Just like any editing program sometimes you’ll find that it works perfectly and sometimes it doesn’t, but the controls in Snapheal give you a much better shot at it. I think one of my favorite things about Snapheal is that when you set it to the higher level precision erasures, and it’s taking a long time, you get these really cool fun facts to know and tell. Like did you know that From east to west, Hawaii is the widest state? or that chocolate was used for blood in Psycho shower scene? Well I didn’t until I learned it from Snapheal. In addition to the brush to make selections you can also use a polygon or free lasso tool to select what you want to erase. With any of the selection tools if you select too much, you can use an eraser to refine what you’ve selected. I know that sounds funny – you’re using an eraser to erase what you’ve selected to be erased – hope you follow what I mean! Sometimes the fastest way to fix an image is to use a clone tool, and Snapheal’s implementation hits the mark beautifully. If removing things was all you needed Snapheal to do, it would be worth the $15 price in the Mac App Store to me. But it’s not a one trick pony, or even a three trick pony with it’s three erasure modes. 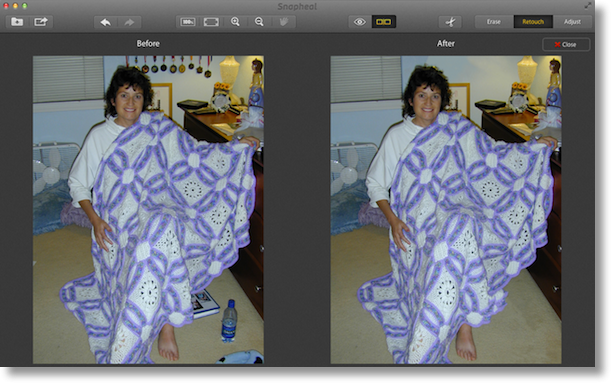 Snapheal also includes image adjustments like exposure, contrast, clarity, saturation, sharpening, and more. Much like the expensive editors like Aperture, you can grab a brush and select an area and apply those adjustments to just that area. Let’s say you’ve got a great photo but dad’s face is in shadow because he had on a hat. You can simply brush over his face and then adjust the exposure until his shining face looks perfect. I tested Snapheal on several photos to see how it worked. I took a photo of me with an afghan I’d crocheted, and I started eliminating all kinds of distractions from the photo. I got rid of a water bottle and slippers on the floor and then erased some hanging medals off of the wall. I did find that choosing different modes had more success depending on the background around the thing I had to erase so it was great to have those options. Next I took a photo taken of me outside against some trees that had a weird bright stripe diagonally across the photo – some kind of sun flare that we didn’t notice on the iPhone when the pic was taken. I used erase, and then did some image adjustments to make the trees stand out more colorfully and to correct the kind of purplish tinge of the stuff on the ground. I was pleased with the ease of the controls and it was intuitive to achieve my objective. Finally I took a gag photo Steve and I staged for a joke we sent over to the SMR Podcast guys – you’ll have to listen to next week’s show at smrpodcast.com to hear why we took this goofy photo. 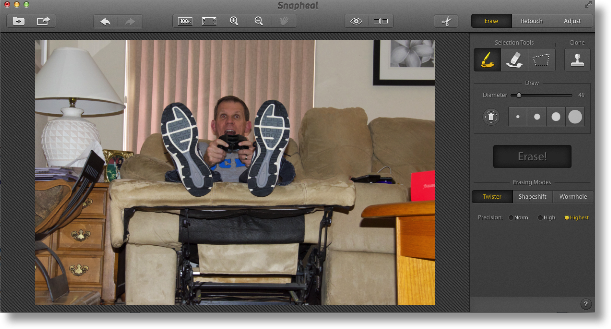 It’s a shot of Steve in a recliner with an old wired Xbox controller in his hands. I used Snapheal to erase the wire, then get rid of a Macbook charger and cable hanging off the couch and finally the Macbook Pro itself that was sitting on the arm of the chair. I did have to do some cloning in addition to the erasing but I think it came out pretty good. While you’re working on your photos, Snapheal lets you view your improved photo side by side with the original, or if you’d rather keep the image large on screen, you can simply hold down the eyeball to see before and after. That’s actually a really fun thing to do, blinking the stuff on and off really shows off what Snapheal has done for you. When your masterpiece is complete, you can export to Twitter, Flickr, Facebook, Tumblr or email for all your sharing needs. I think Snapheal is well worth the $15 in the Mac App Store and I’m really glad they’ve brought this awesome functionality to the Mac desktop. Heck, they’ve even got a free 30 day trail over at snapheal.com if you want to test it out yourself first. Hi Alison, Thank you again for a wonderful podcast – it always cheers me up on a Monday morning. I have looked at their service and it looks stunning but can’t see why I should bother to leave the blogger environment. In the beginning I did consider going with WordPress because I like the geek aspects of it but as a working physician I just don’t have the time to tweak and maintain a WordPress installation. So I’m just wondering why you chose the route you did and why you also didn’t go with Squarespace? After all, it would eliminate the problems of downtime and all the hassles of staying up to date with no worries about hackers and flaws allowing you to focus on the content. I really look forward to your (and Bart’s) thoughts and hopefully I can put this lust for more shiny web hosting behind me!!! SwitcherMark asked the same question in Twitter by asking “why not SquareSpace?” I think this is going to be one of those “what problem are you trying to solve” questions. In my case, the problem I was trying to solve was to get away from GoDaddy. I like WordPress, and I especially like that I have friends like Bart and Niraj who are amazing at it so they help me when I get stuck. It’s kind of like when people ask me whether they should get a Mac for the first time. I always ask them first, “who is going to help you when you get stuck, and what did THEY tell you to get?” If they say Windows, I tell them to get Windows! I like being able to redesign my site, and to extend it with plugins (even if my number of plugins makes Bart crazy). I understand how it works and I do enjoy the level of geekiness I get to exercise managing it. The changes I made this week will give me even more geek opportunities, like Bart talked about teaching me to make a script to run my own automated backups. Yippee! On the other hand if your main goal is to have a good looking site where you never have to much with managing it, and you’re willing to accept reduced flexibility (fewer themes, fewer plugins) you can use WordPress.com which is a hosted version of WordPress where they manage everything. If you’re willing to live with a wordpress.com domain name like podfeet.wordpress.com, and you can live with ads on your site delivered by wordpress.com and not doing any of your own ads, and you like the idea of a FREE service, then wordpress.com is a great alternative. Not for me, but suits a lot of people just fine. Now let’s talk about SquareSpace. I know virtually every podcaster right now is advertising for them, and that creates great buzz and makes you feel like it must be a great service because they all gush over it. Remember though, these are ADS, not necessarily how they feel about the product. It kills me to point this out but when you hear me gush about ScreenSteps and Clarify, you have to take that with a grain of salt and remember that they are an advertiser. By now the number of testimonial examples I’ve given have gotten a lot of you to buy these products at least once (Kevin seems to buy them once a week) but still, these ARE ads. I remember ages ago everyone who was anyone was advertising for Drobo. Remember that? It even caught the Sheridan household, we convinced ourselves we needed one. Well, convinced Steve we needed one. Since I’m a good little wife, I got him one. It does do much of what was advertised but I actually think it has a lot of failings, and now most of my podcaster buddies feel the same way. I’m not saying by any means that you can’t trust these people, far from it, it’s just that in an ad you don’t ever say what you don’t like about a tool. There are still things I’d like to see improved in ScreenSteps and Clarify but I’ll be darned if I’m going to tell YOU guys about it, right? So with all that giant caveat in place, I too find myself thinking maybe I should try Squarespace! the ads ARE very compelling. However, you mentioned in your note that with SquareSpace I wouldn’t have to worry about downtime, but that’s not really true. Any web hosting company can have problems and cause downtime to their users. There’s no magic sauce that these guys use that make it impossible for them to have system wide failures. I know they have expanding resources (as do other hosting companies) in case you make the top of Reddit, but that doesn’t mean their systems can’t fail. They’re all using computers all managed by humans, so failures happen. With all that said, the one ad that really does compel me is Ken Ray’s from Mac OS Ken. He will tell you that he’s not the technical guy and yet he was able to build his website using SquareSpace with very little effort and he’s sincerely happy with the results. That’s provable because MacOSKen.com looks completely different than his old site and I know he did it himself, so that’s a good sign. I expected from the SquareSpace hype that every site made on their service would look completely different. They are pretty but I notice a certain similarity between them. They do have a fresh look about them which is cool. I have definitely been tempted to give SquareSpace a try but I really do like to play with this stuff and get a little dirt under my nails. So if you’ve got a site you like, but you want to play with something more fun, but you don’t have time for getting down and dirty, SquareSpace might just be a good option for you to get a change but not have to spend hours and hours fiddling with it! Or you could just stop eating, don’t shower, leave your family on their own and get geeky with WordPress! It’s up to you. Speaking of ads, let’s talk about Clarify! Forget everything I just said and believe me with blind faith, ok? You’ve heard me talk about Dorothy (aka @maclurker) a lot of times – she writes scripts for me and helps me out a lot with the back end stuff for the show. She gave me permission to call her cheap though. She won’t spend a nickel unless you really justify it to her. She’s heard me rave about Clarify, even while we’re at the gym and I don’t have to be telling her about it (yeah, I’m a lot of fun to hang out with), but she had never bought it because she was cheap. When the MacHeist mini-bundle came out, she could no longer resists. She paid a grand total of $10 for 10 apps, one of which was Clarify. In the same Macheist bundle we had both gotten PathFinder and were learning to use it. I noticed that the Services I use were not available if I right clicked on a file inside PathFinder. For example, when I’m done recording the show, I right click on the audio file, select Services, and then I select the Service Dorothy wrote for me that runs Levelator on the file, pulls it into iTunes, adds the meta data tags to the file, embeds the NosillaCast logo in the the fie and converts it to an mp3. But in PathFinder the service simply doesn’t show up. Dorothy wrote back and in her words she said, “I have to get my money’s worth out of Clarify, I mean I did pay a whole dollar for it you know, so here’s an explanation of how to get the Services to show in PathFinder.” This was one of the simplest tutorials I’ve seen but it was EXACTLY what I needed. She showed how in Automator you have to change one itty bitty little control. She gave me a before screenshot and an after screenshot with two arrows to draw my attention to what she changed. This two step Clarify document took her probably 1 minute to create (maybe more because she was learning how to use Clarify, but it SAVED her a lot of time because if she’d written that to me in text form I guarantee I would have written back and forth with her at least 2-3 times before understanding what she was telling me to do. Using Clarify is an investment of your own time to save yourself time in the future. Check out Clarify from BlueMangoLearning.com for a free trial, or click the Clarify logo in the left sidebar at podfeet.com to buy it in the Mac App Store. Last time we talked about /etc/fstab, and how on Linux it is used during boot to mount partitions into the filesystem. We said that the Mac doesn’t have a /etc/fstab, and that it has a dud files called /etc/fstab.hd that tells people not to use it. It is true that OS X does not have a /etc/fstab by default, and it’s also true that /etc/fstab.hd does nothing, HOWEVER, if you create a properly formatted /etc/fstab, OS X will process it correctly during boot. OS X even has a command line tool specifically for making changes to /etc/fstab in a controlled way so as to make it impossible to introduce an error – vifs. Although you can use /etc/fstab to mount disks/partitions to anywhere in the file system, what it seems to be used for most often is to stop disks people don’t want to see from automatically mounting by using the keyword none as the specified mount point – http://reviews.cnet.com/8301-13727_7-57507755-263/how-to-prevent-a-volume-from-mounting-at-boot-in-os-x/. Bart’s rant on Android security may be correct, if possibly hyperbolic. I regret there’s no link in the shownotes to his cite. Probably he’s talking about the recent “discovery” that some Android Apps tied to a mobile advertising network lurked peacefully for months, then started pop-up ads luring users to download and install fake anti-virus programs that were indeed malware(s). 32 Apps were “infected.” They were, for the most part, Russian, including some free games. 1. Downloading Apps that were Russian or from Russia (most or all). 2. Clicking on an ad to download an App (APK file). 3. (Probably) enabling the Android feature that enables Apps to be sideloaded other than from the Google Play Store. Now this shouldn’t be possible on an iOS device unless it is jailbroken. That’s because Apple has established and maintains a monopoly over the sale and distribution of iOS Apps. On iOS you’re totally dependent on Apple successfully identifying any threats before they’re published to the App Store. As Bart said, you can’t run your own local anti-virus. With as many Apps as Apple processes, and ingenious as “bad guys” are, stuff does and will slip through. Google is aware of problem, both the threat and the damage to Android’s image. At I/O May 15-17 Google announced a new the “Google Play Services” module which is now core to Android and runs across all versions that runs across from 2.2 forward. This new “module” installs outside the “carrier and manufacturer blockade” that has made updating Android difficult and will enable Google to actively and proactively increase the OS’s security (as well as enhance Google’s ability to sell you stuff directly). Google has been scanning Android Apps on the Play Store since early 2012. Android Jelly Bean (4.2.x) includes a native scanner. But nothing is perfect. So if you’re running Android, turn off that option to install from third party sources and only turn it on to install from Amazon, or perhaps to install the AdAway blocker that would protect you from malicious ads in the first place. Now the biggie. What is malware? How about a program that activates the microphone on your phone and transmits everything it hears to a remote server where voices are “printed,” every connection you make, every contact you have,every click you make, every ad you view, is identified, stored, processed, with others are identified, your movements are tracked by GPS, and all the data stored, processed, and analyzed? Which is why IBM banned Siri from its workplace. That “always on” microphone sending IBM and IBM customer confidential information to Apple for processing, storage, and retrieval just wasn’t acceptable. The “threats” described in the F-Secure “paper” seem very similar to and probably are related to the 32 Apps “discovered” by Lookout and tossed from Google Play Store. Whether on a computer or a mobile device, don’t click to install an App suggested by an advertisement, or that just pops up and asks to be installed. On Android keep the option to install from third parties off. Don’t install pirated Apps. Beware Apps from Russia and China. F-Secure sells anti-virus for Android. $14.99 per device a year. What was it Allison said about the Drobo drumbeat? In the security field it is FUD. Apologies for the partial post 2 up. I’d like to blame it on malware in the Android Galaxy Nexus phone on which I was typing. That tiny little box WordPress presented my phone browser was difficult to navigate. So if there’s malware, it’s the human in the machine. Long been told I’m maleficent, and not the fictional Disney character. I love knowing that I can order my Mac to speak, using the Terminal, but there is an easier way. If you just want to speak some text, select it, right-click, choose Speech > Start Speaking. To save the text as an audio file, using OS X Lion and later, just select your text, then right-click and choose Services > Add to iTunes As A Spoken Track. From there, you can name the snippet to be converted to an audio file, and choose the voice you want. You don’t have control over the speaking rate with this shortcut, as you do in Terminal. Oh, you can turn text to spoken tracks in earlier versions of OS X, but the option is not enabled by default in Services. You have to set it in System Prefs. I used to use an app called books2burn that would convert long text files into audio, based on settings I specified. It could even split book-length documents into chapters.I don’t think that has been updated in several years, but I’m sure there are others out there that do the same thing. For what it’s worth, Squarespace is really impressive technology-wise. Their drag-and-drop site creation engine is superb, once you get the hang of the UI. And they have some pretty good technology under the hood, and perhaps more important than that, good people that ensures that sites stay up, come he-double-hockey-sticks or high water. And I mean that literally. In a famous case, during the whole Hurricane Sandy disaster, their datacenter in NYC stayed online despite days without power, thanks to data center staff as well as customers (including Squarespace president Anthony Casalena) who quite literally formed a fuel “bucket brigade” to ensure that their backup generator remained online. Also Mac OS Ken loves Squarespace. He actually uses it for his site. And although his daily show is sometimes sponsored by Squarespace (i.e. he advertises for them), Ken has also frequently spoken highly of them even in contexts where he was not obligated to (e.g. guest appearances on other shows where he was not obligated to perform an ad spot for them). Disclaimer: I do not now, nor have I ever, advertised for Squarespace. I do not benefit in any way, financial or otherwise, from saying what I said above. I just happen to really like the service, even though I don’t personally choose to use it.